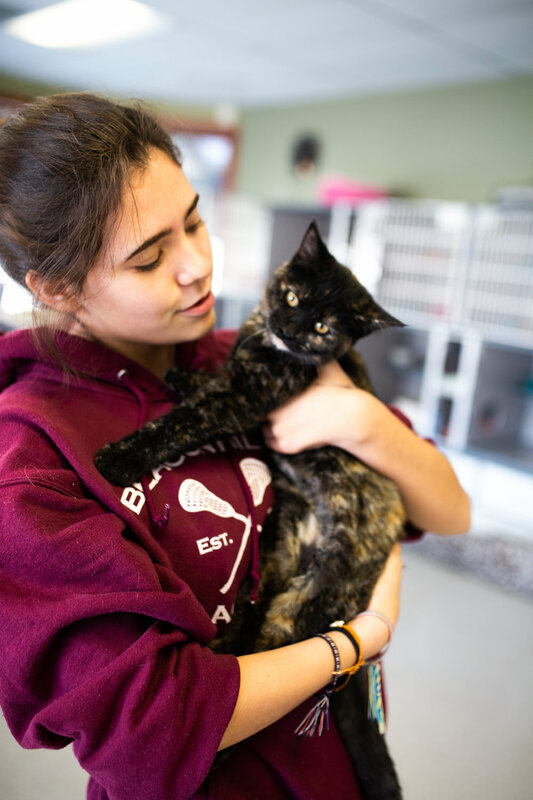 When Anika and I first considered volunteering at the local cat rescue, we thought it would be sad. We imagined the cats would be lonely. And that volunteering would be difficult. Instead, we find joy. 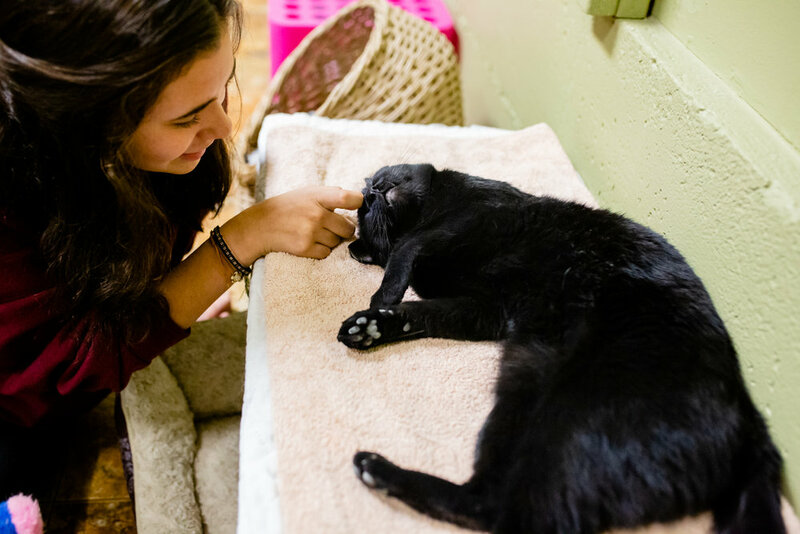 We find ourselves visiting weekly to visit with the cats (and our new friends volunteering). Each cat has his or her own personality. And we all celebrate when they find homes. Yes, the surrenders can be challenging to hear about, but it’s also gratifying to know that the cats will have an excellent opportunity to find loving families. 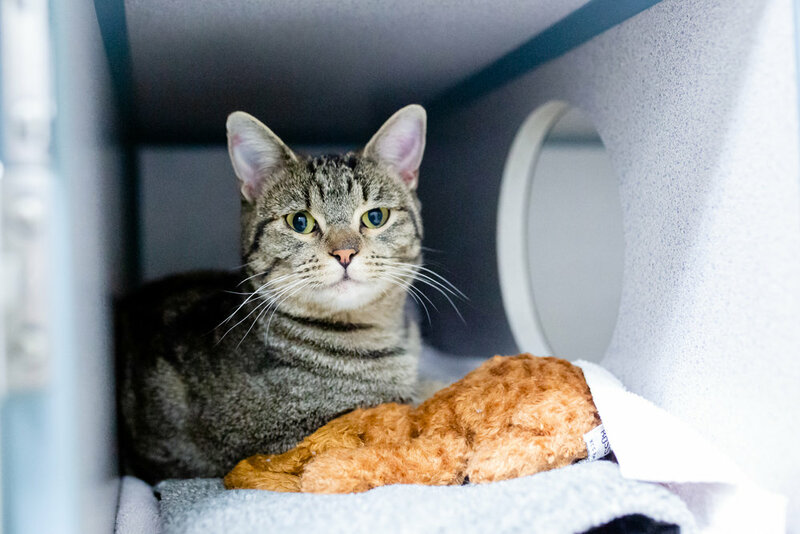 When cats arrive, they go into an TLC Room, where they are in their own space while they adjust to the big change in their world. They receive a check up for a health history. If they are not spayed or neutered, they are scheduled for surgery. And they receive age appropriate vaccinations. When I first photograph them, they may be wide-eyed because the TLC room because they can be cozy in their kennel away from bright overhead lights. They may be shy. Or they may be ready to get lots of pets and wanting to explore the new room. We always put the cat’s needs first. I want them to be comfortable with me and the camera. If they have anxiety, I wait for portraits another day. Once they have a clear bill of health and are comfortable in their new circumstances, they go to one of three places. One is Penney’s Place Sanctuary, which is a large room with smaller cat-friendly spaces away from the public. This is where cats who are more skittish or sensitive can acclimate for awhile. Another is the “Kitten Rooms” which become cat rooms when there aren’t kittens for adoption. They’re smaller, cozy spaces with lots of windows where a cat can be away from lots of other cats. The last spot is the Cat Room, where cats hang out with lots of toys, cat trees, and other cats. There are plenty of ways for them to be together or find their own chill zone. Folks can visit with cats in the Kitten Rooms and the Cat Room. All the cats at AnimalSave stay until they find homes. One of the longest tenants has been there for a few years. Though most cats connect with a family within a few days to a few months. Each week, we check in with familiar friends. The cats befriend us. They come out when they hear our voices, especially Anika because she plays with them while I take photos. It’s fascinating to see how cats react (or don’t) to the camera. I am super-respectful of the cat’s comfort. I don’t shove the camera in their faces. And if their gaze or body language stiffens, I lower the camera and talk and pet them. Some cats get nervous about the “beep” of focusing, while others are intrigued and look curiously at the lens. It’s become a bit of a personality quiz to me to see which cats are confident and friendly and which cats are shy and hesitant. The best is when a cat is skeptical, maybe even scoot away from me, only to greet me with open confidence a week or two later. Cadence is like that. And Romeo was super shy with everyone at first, just people in general, but he’s now the most outgoing, love-bug. It’s so rewarding to see! You can follow along with the cats’ stories on AnimalSave’s Instagram. Learn about AnimalSave online at animalsave.org. And you don’t need to adopt a cat to help the cats. Donations are always appreciated. And volunteers are essential. We are thankful for everyone at AnimalSave giving these animals happy new adventures.